HomeThe Andrew Wiggins Game Winner, revisited. The Andrew Wiggins Game Winner, revisited. Oh, the glory that was the Andrew Wiggins game winner. First off, enjoy below through a slow-motion, infinite loop of the game winner. Here is it full speed. This game was crazy. The amount of big shots hit felt like a video-game version of a playoff game. The hype for seeing these two new-look teams was exceeded by leaps, bounds, and buzzer-beaters. The fact that Russell Westbrook’s multiple big 3s, KAT’s floater to take the lead, and Melo’s three with 4 seconds left to take back the lead, will all be overlooked. Andrew Wiggins, aka Cornrow Andy (shout out Augie 5000), bka Maple Jordan, took the ball full court in 4 seconds and hits a contested three from between the half-court and three-point line. There is no better chemistry builder than a buzzer beater on the road. So taking a turn, I wanted to ask a couple questions, to really understand how great this was. I’ve been reading the Shea Serrano book, Basketball (and Other Things), and it has inspired me to ask questions to analyze things. I think we can say he is now. Right? He hit a game winner against the Suns as he was draped in the, twice his size, PJ Tucker. As mentioned here, that was only the third time the Wolves hit a shot to win as time expired and would’ve lost had they missed. Wiggins shoes up twice here. That’s pretty significant I’d say. Wiggins had practiced this shot he just made though. Not long ago either. Just a few days before this game winner actually. That all said, being clutch is all about opportunity. You have to play in close games. You have to get the nod from the coach to take the shot. And clutch doesn’t mean you hit 100% of the buzzer beaters but that you are at or above your regular shooting percentage when the pressure is on. So, I do think now that Wiggins has hit a good amount of these buzzer beaters, we can label him clutch. Who had the best responses on twitter? Obviously Zach LaVine and Ricky Rubio. I mean, even though LaVine technically called Wiggins an old lady apparently. I wanted to burst into tears seeing that LaVine and Rubio were happy for Wiggins. Especially after Rubio just lost at the Target Center. Good to know they are still watching. Definitely miss those guys. Folks on the National scene were taking notice as well. But the best is the humble brag by Wiggins himself. Who is better, Green Shoe Andrew or Cornrow Andy? Cornrow Andy has a smaller sample size so we will have to see what else comes out of it but he is off to a strong start. Wiggins hit the halftime buzzer beater in the home opener on Friday and then managed to hit this game winner as well. CRA has also been scoring at will this season, all while filling the box score (something his haters love to call out). His jump shot looks great as well. This alone indicate that Cornrow Andy is trending up. Green Shoe Andrew was pretty impressive though. 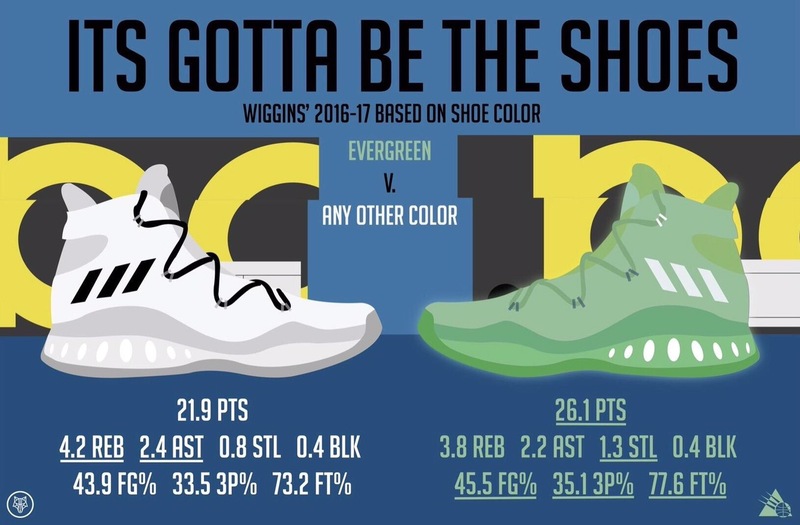 GSA was slamming on all of the league’s biggest and best shot blockers while averaging 26.1 points when wearing green shoes. This is still an open debate but what I really hope is that Cornrows and Green Shoes meet this season. Was this the best buzzer beater in Wolves history? I think so. Time will tell. The iconic Malik Sealy buzzer beater, where the entire team piles on him, is unforgettable. The Kevin Love buzzer beater against the Clippers on ESPN where he walked away with his hands out and a youthful Ricky Rubio (we still miss you) jumping on his shoulders. The celebration alone makes it among the best and that shot captured what the hopes and dreams were for that rebuild around Love and Rubio. But those were both plays from half court and they came off of timeouts. Andrew Wiggins took the ball full court in 4 seconds after the devastation of losing a 2-point cushion to a 3-pointer by Carmelo Anthony. Wiggins had to free up to get the ball, use Karl-Anthony Towns’ potentially illegal screen to shed Paul George, and pull up from the OKC logo with a few tenths of a second left to spare, just so the celebration would not be interrupted by an official review. ALL OF THIS, WITHOUT TAKING A TIMEOUT. Are you kidding me? I take my ‘I think so’ statement back. Yes, this was the best buzzer beater in Wolves history. How many others have their own blog post? First off, stop questioning his contract. The man deserved it. Secondly, enjoy it. The Wolves have not looked perfect out there but this will certainly help. I can’t wait to see the rematch on Friday. We will likely see Angry Russell, which is the worst beast you want to see in the league. Lastly, Sam Mitchell was right. Something I don’t like to say. But Mitchell was absolutely right. He snapped back at Doogie Wolfson when he tried to question Wiggins’ drive and ability.